By making use not only of signals from standard signal-emitting devices installed in facilities (Wi-Fi, Bluetooth beacons, etc. ), but also of geomagnetic field fingerprints (which vary in accordance with a building’s shape) combined with the user’s dynamics (detected by a state of the art Pedestrian Dead Reckoning), this services will accurately calculate location, even in indoor areas beyond the reach of GPS, simply by using a smartphone or other off-the-shelves devices, enabling users and businesses to leverage high-precision location information. 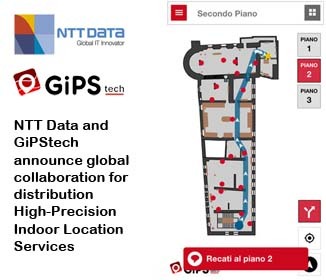 The technology was developed by GiPStech, which is in a partnership with NTT DATA Italy. Companies will be able to utilize this services for a wide variety of purposes, such as navigation in large commercial facilities, the grasping and analysis of traffic lines, the visualization of congestion, and evacuation and rescue operations in indoor emergencies. NTT DATA will distribute these services to companies with indoor facilities that are predicted to experience increased demand for the utilization of location information. Utilization examples include detailed user guidance within facilities, employee management, and more. In addition, in the future, NTT DATA will aim to expand the number of users through efforts such as linking this service with services in lateral areas. NTT Data is confirmed as one of the most attentive companies in the tech ecosystem. Also thanks to their commitment today, we will be able continue to respond to the growing interest that the market is showing for our micro-localization technology, a patented tech portfolio that is proving highly valuable to businesses of all kind: from airports to metro station, from factories to healthcare. This newly announced collaboration with NTT Data will allow not only a greater commercial reach for our solutions, but also their immediate integration into pre-existing software solutions.